Labrador Retriever Puppies For Sale! Connecticut is certainly a perfect place to raise a labrador puppy. With the state having so many parks and recreational areas, as well as dog friendly common places, your young pup will surely grow to becoming a healthy, happy, and strong adult. There’s no surprise that labrador retrievers are the most popular dog breeds in the United States and in the United Kingdom, they’re great with children, amazing at assisting those with disabilities, and are one of the easiest dogs to train because they are so intelligent. Labrador lovers also have the great liberty of choosing from 3 main different colors which one they like the most. Though some are more known for having specific traits, they aren’t all that different from each other anyway. Nonetheless, let’s go through what makes one more popular than the other. The yellow labrador is often associated with guiding the blind, the black labrador with gundog work, and the chocolate labrador as pets at home or for dog shows. Ultimately however, it has been discovered that each of the different colors of the different labradors are able to excel in either of these known traits of above par performance. So perhaps it matters little. There’s also the question of which labrador do you want, the English or the American? Labradors bred for show are commonly known as English Labradors and are more common in the UK. Labradors bred for field trials and hunting are commonly known as American labradors and are more common in the USA. However, many American labradors enter dog shows and many English labradors compete in field trials and are used for hunting. Though this may seem so confusing and picking one may seem like such a daunting task, but it’s really not that hard since all labradors are all good at what all other labradors can do anyway. The more important question to ask, is are you ready to be a labrador puppy owner? Let’s go through a few questions that you should ask yourself as you prepare to purchase your labrador puppy. Have you got the space to raise a large dog? Even as puppies, labradors need quite a bit of space. Whether it is indoors or outdoors. For the space they need outdoors, it is pretty obvious. These puppies can run long and far and need to stretch those growing legs of theirs. But nonetheless, be prepared to know where to take them so that they can run either without restriction or at a space large enough that even if caged, won’t be a space too small for them. Indoor space can be more of a challenge. Labrador puppies typically bounce off the walls and their long, thick tails tend to knock down decorations found on shelves as well as glasses and anything else it comes into contact with. You may have to move ornaments onto higher shelves and beware of their growing teeth. They may be small but they sure are sharp and can tear up delicate furniture as well as seats and other fabrics found around your house. Labradors also need to be potty trained and as puppies need bathroom breaks as often as every 15-20 minutes. If you live in an apartment complex or building, doing this may be a challenge. You do have the option of having them use puppy diapers or newspapers, but as they get bigger, you’ll have to retrain them to use the bathroom outside of your house. Some dog owners are able to use doggie crates to help potty train them but these do take up quite a bit of space. Ideally, having a garden would be the best. It is a contained space in which your dog can not only run around but can also learn to use the bathroom. Just make sure that you have a good system for cleaning up after them. Do you have the time needed to love a dog? There are numerous sad stories that have come out of new puppy owners admitting that they are unable to balance their regular work lives with raising a puppy. These pups end up home alone all day while you’re at work, and meanwhile, they’ve destroyed your furniture and knocked over a bunch of ornaments because you were unable to oversee them. It certainly isn’t their fault, but it is common that the dog owners end up getting mad at their young pups. Older dogs may be a bit more independent and less in need of your loving attention but puppies certainly require more of your time, patience, and love. In the end, a young dog should not be left alone for long periods of time and if this were to happen, one cannot expect the dog to behave as you would want him to. A healthy reminder is that dogs that are alone will make tons of noise and break things that he can get his teeth on. If you need to go out and work all day, it is best to have someone in the house with him to take him out for walks, bring him to the bathroom, play with him, train him not to break everything, teach him what he can and cannot bite, and give him water to drink and food to eat. These tasks may be a lot to ask of anyone, so be sure that who you leave these responsibilities with is someone who also loves your dog. Beyond the necessary early training of a puppy, there is also the long term commitment in training your dog to be able to co-exist in human society with being a complete nuisance to everyone around. This daily commitment and regular interaction is what will teach your dog to behave and ultimately be a good dog. Training a dog is not something that you need to do only weekends. If you try this, you will see that by the time the next weekend arrives, your dog would have forgotten everything you taught him the week before. Dogs do not have the attention span to concentrate for over an hour, this is why it is necessary to train him everyday, throughout the whole day. Besides all of this training, there is also the exercise your dog needs. An hour of walking/running is good, but this too is daily, not only on weekends. Missing a day here and there will not be so bad, but making this an important habit is also what will keep your dog in tip top shape. Are you willing to put in the money needed to care for your dog? In the first place, a labrador puppy is not cheap. If you can, you still need to do the math and compute if you can also afford their expenses in raising them. In the USA, a labrador puppy sells for anywhere between $800 – $1200. In the United Kingdom, a well bred labrador will go for about 650-850. Knowing someone with a litter of pups to give away certainly makes it easier to acquire one, but ultimately, purchasing a labrador is just a tiny expense in the grand scheme of things. The truth is that labradors will cost a lot of money in caring for them. In order to keep them happy and healthy, a big chunk of money will have to be spent on them, starting with proper puppy food that offers the correct ingredients that your puppy needs for proper puppy growth. It’s just like formula milk for babies, it ranges and changes as the age of the baby grows. There is also veterinary insurance which can be such a big help, but also does cost a pretty penny. In the olden days, it was sad but “putting a dog to sleep” was a common method practiced for dogs with ailments that could not be treated. But in our modern world, there is a lot that your veterinarian can do for your puppy. Dogs have now undergone open heart surgery, mended complex fractures, and have been treated for cancer with the help of radiation and/or chemotherapy. So, like humans, dogs too can pretty much be treated for the same types of treatments that humans receive. And in doing so, dogs can also avail of insurance that can save their owners tons of money in the event that your dog gets sick. Naturally, the more comprehensive your insurance is, the better your package will be. You also have to vaccinate your puppy. There are plenty of common canine diseases and having your dog die after a few months is just heart breaking and unnecessary. Then there are the more obvious expenses such as bowls, beddings, collars, leashes, and food; as well as the less obvious and optional t-shirts, strollers, and toys, etc. Buying a labrador puppy will also change your lifestyle, for the better of course! They’re so cute and friendly and great with children and have some of the cutest personalities of all the dogs, so be prepared for lots of love and smiles and laughter. But as we said earlier, if you work a lot and spend a lot of time out of the house, then maybe this isn’t such a good idea? Also, if you are one who travels often and would have to leave your puppy at home, then perhaps it is not yet the right time for you to be a dog owner. Sleep ins on weekends may be harder to achieve as well, your dog is going to demand your attention and will need to be fed, and taken out to go to the bathroom, and played with. Remember that it is your lifestyle that will have to adjust to your puppy’s, not theirs to yours. Will having this dog fit right in with your family? Think of your puppy as a human toddler. That is the sort of attention that they need. Having a puppy is great for young children as well, but do bear in mind that having 3 young children and a pregnant wife may be a scenario that tells you that you’ve got enough on your plate right now and that having a puppy now may seem like bad timing. But if your kids are for example, over 5 years old and able to walk on their own, speak their thoughts, no longer need to be carried all the time, and are accepting that your pet dog has important needs too, then this might be a good age for them and the whole family will benefit from having this puppy around. Is a labrador really the right breed of dog for you? Labradors by nature are very playful dogs. They will jump all over your house, they’ll bite and chew everything from furniture and the seat of your motorcycle to your pair of flip flops. They grow to a rather large size, eat a lot, but are also loving, intelligent, and loads of fun! Have fun with your puppy labrador, they will give you joy to no end and will stay by your side with 100% commitment to you and your family. 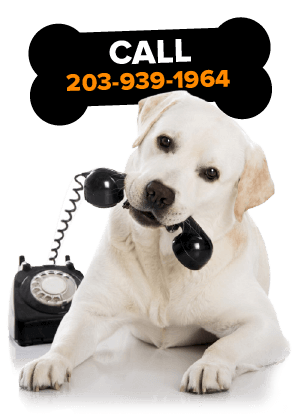 If you want to have a Lab, call CT Breeder – (203) 920-4950.